Memorial Day is this weekend. How did that happen? It truly seems like it was just Christmas. 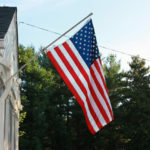 We fly our flag nearly every day and when it’s a special patriotic holiday, I enjoy adding extra flags to our outdoor décor. 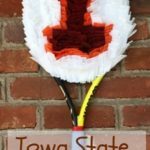 I crafted a Patriotic Wreath using a tennis racket as the base that will be perfect for Memorial Day, Flag Day, and the Fourth of July. 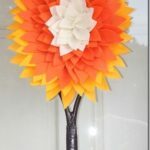 If you are a regular reader, you may remember a similar wreath that I made last summer. For step-by step directions for how to make this project, click here. All you need is a tennis racket, silver spray paint, felt in red, white and blue, a rotary cutter, cardboard, and glue. Even a calm, cool, and collected person like Mr. SP gets so frustrated by tennis that the urge to beat a racket against the ground or perhaps a fence is irresistible. It’s a very expensive stress relief but does provide me with craft material. I love the pop of red, white, and blue on my door. Annuals in the pots are red and white and will look great with my wreath when they start blooming a bit more. They were freshly planted when the pictures were taken. 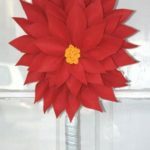 I sprayed the felt petals with a fabric stiffener after the wreath was constructed. Virginia is hot and humid and without the stiffener, the petals would droop in a very short time. 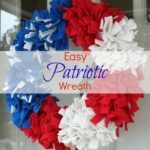 This Patriotic Wreath not only is a fun decor item, but by making it I kept a tennis racket out of the landfill. So patriotic! I love it! This is a really neat idea. I haven’t thought of using fabric stiffener on felt. Why? I don’t know! I read your comment on jelly beans, too. I love them so much, i give them out to my piano students. That is BRILLIANT! Who would’ve thought to use a tennis racket??! Love it! New GFC and Linky follower! Found you on the Live, Laugh, Rowe blog hop! Love this idea! Had to laugh at how you obtained this racket. Visting from WOW and am a new follower. 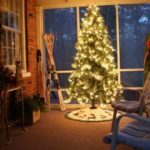 Your wreath looks great – a tennis racquet, huh?? Too cute, Paula! Love that red, white, and blue! I love it! I am very patriotic too and a supporter of Soldier’s Angels. Thanks so much for flying your flags! I stopped by from Kristen’s and so glad I did. I look forward to more of your creativity. What a great idea for a wreath! This is something I can make with my boys – thank you for sharing! Wonderful and very creative idea! I love your whole front door! Poor tennis racket, glad you were able to salvage it and give it a new life as a patriotic wreath! Happy birthday Paula! Hope you have a wonderful birthday weekend! Just saw this on TT&J and love your wreath idea. Very creative! 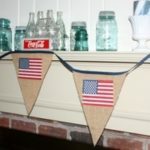 I would like to invite you to link up your project at thecheckeredapple.blogspot.com for my Patriotic Link Party going on right now through July 4th. Please stop by! I do remember your tennis racket wreath from last year, but I must say I love the red, white, and blue version! Perfect for y’all and for all tennis fans! 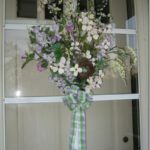 I like the way you added the stiffener to the petals–NC is very humid, too, and things do great droopy, don’t they? We are so enjoying having a long weekend. Memorial Day used to always be on May 30, back before it was changed to be on a Monday. My mom’s birthday was May 30 and my dad’s was June 14, Flag Day! How fun and festive! I hope you’ll add this to my Patriotic Project Parade! Cutest wreath ever! 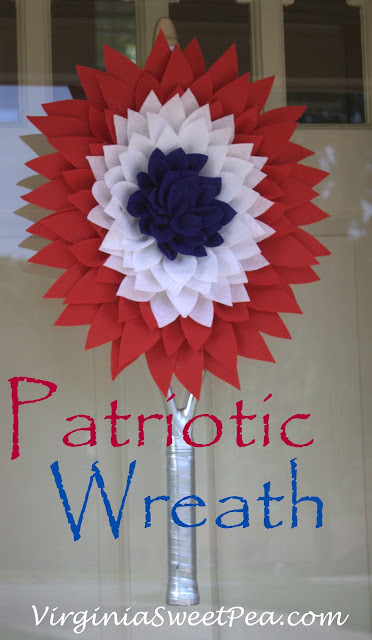 Pinning to my “wreath” board!